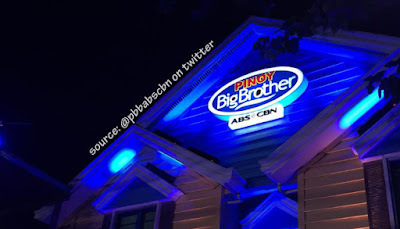 This is the first time I saw Pinoy Big Brother House (abbreviated as PBB) up-close, the most popular house here in Philippines. Actually, there are so many names people called this house. Yellow House, as one; Bahay ni Kuya (in Filipino language), the other one; and PBB House by many. 2nd Day of our Educational Tour, that was February 2013. We are scheduled to have a Studio Tour in ABS-CBN compound, morning of that day, exactly 9:00am. We arrived too early, i think we are 30 minutes advanced before we are allowed to get inside of the building. So, our tour guide decided to go around. Upon hearing, we will be going to have a visit into the Big Brother House. I was shocked and said, "Really!?". Then, the tour guide got his microphone and announced that we will be seriously going to the PBB House while waiting for the time scheduled to us for Studio Tour. It makes me feel more excited like, whoah! I said, "Ok, nice!". I can't stop staring out the window while we are approaching to our destination, because i really really want to know where that house located. You know, i'm a fan of this reality show ever since it started, year 2005. I love watching how a person interacts with certain situation; the life story of each characters; and Kuya's very challenging tasks given to the Housemates as well, it can be personal, weekly or secret task. Back to the story. A few minutes later, i saw a gate with PBB logo. Oh! I think, this is it! Time to retouch before we left our bus, as if we will go inside the house or have a formal pictorial. Hahaha. That feeling, I can't wait to go outside the bus to touch the gate of the house and stare it up-close. Urgh! I think, i am one who go outside the bus first and run across the street even there's a car approaching. When i got there, i was so amaze, but the one caught my attention is the nearby building of the house. It is covered with canvas, as if there's something inside of it. While taking a look into it, there's a guard so i turned back my attention into the PBB House. Oh! I thought you're gonna go inside the house. But yes, I have the same feeling when I went there too! That house has been one of those popular houses because of the reality show. I think I would like to visit that house during Christmas as they have design outside. I auditioned Season 5 (PBB All In) and Season 6 (#PBB737). Been busy that i missed the opportunity to audition this season. i have never been a big fan but given the chance, I might as well take a selfie with the house as well. i am sure you are so happy with the experience. Congrats! I was as dumbfounded when I first saw the Big Brother House. QC is my home now though, so it's no surprise to me anymore! Seen the house numerous times when we attend shoots, not really a fan of the previous seasons except the first few ones. Great though that you were able to visit! Wow this is cool!! I want to go inside hihi! Wow! After all these years, the most popular house still stands their up to date. I wonder how they keep it intact through all the years.